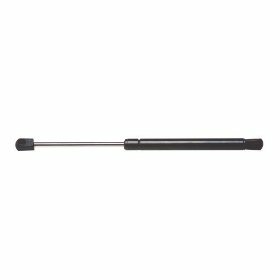 StrongArm gas charged lift supports are custom engineered and manufactured beyond industry standards to provide smooth operation and durability. The hardened chromium plated steel shaft is precision ground and polished for superior corrosion resistance and leak free sealing. The self cleaning piston assembly automatically opens during each compression cycle to keep the orifice clear of fluid contaminants and provide smoother operation and reliable performance. Most units also utilize StrongArms patented temperature compensation module valve which ensures consistent operation even in extreme weather conditions. It does so by compensating for normal gas pressure changes caused by temperature variations. The metallic upper bushing is manufactured with bearing quality precision to provide exact fit with pistion rod and promote a long operating life.